The best dry erase lapboards on the market! The Dry Erase Lapboard Class Pack is the ideal learning tool in the classroom. From young students learning to write, to older students interactive learning, these whiteboards are perfect for all ages and multifunctional! With 30 durable, white Masonite lapboards that measure 8.25'' x 11.75'' each, you can give your students a dynamic learning tool at a great price! There are plenty of lapboards for an entire class, and since they come with a handy box for storage, they won't take up space in the classroom like other learning tools. Also included: a box of 30 pocket-style dry erase markers with bullet tips in black and a 30 pack of 2 inch multi-purpose erasers. Simply write, wipe off and re-use with no waste. THIS IS A LIMITED TIME OFFER-ORDER NOW! ✅DRY ERASE BOARDS - CLEAN WITHIN SECONDS: Are you tired of wasting your time cleaning off a stubborn dry erase lapboards' surface? Good news! 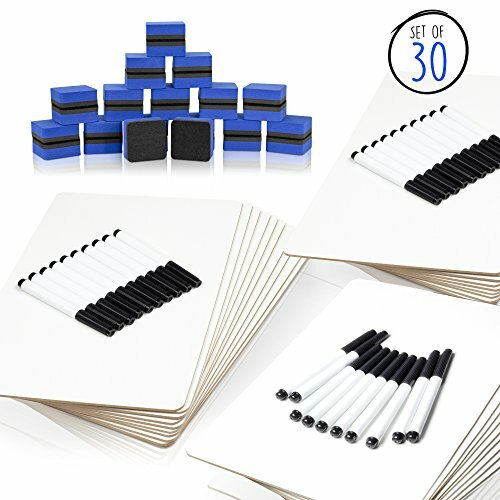 With the included erasers you can wipe the dry erase boards clean without smudging your hands or clothes! ✅DRY ERASE LAPBOARDS - PERFECT LAP-SIZE: At 8.25'' x 11.75'' the mini whiteboards are are large enough to draw diagrams while being small enough for young children to handle easily. The perfect dry erase board for kids at any age! ✅STOP WASTING PAPER with our dry erase lapboards! Look forward to using these hour upon hour while you stop wasting vast amounts of paper. If you're environmentally conscious and searching for a high-quality product, it won't get better than this!